This delicious recipe is adapted from The New York Times, as well as from the beautifully-illustrated cookbook The Art of Simple Food by Alice Waters (I've also borrowed a bit from a recipe of my mother-in-law). Ms. Waters writes: "A properly seasoned and cooked roast is an elegant and simple dish to prepare, and something very valuable to know how to do confidently for feeding a large gathering of family or friends." A 4-pound boneless chuck roast really works best, but you know how it is, sometimes you just work with what you have available at the butcher's that day! Here's a nice guide to the various cuts of meat at the butcher; also, please read my related blog post about how not to buy chuck roast. Don't forget to fully defrost a previously-frozen roast, and to season the meat with a dry rub of salt, pepper, and garlic powder the day before, if possible. This recipe, as long as you start with a high-quality chuck roast with some fat on it, turns out so tender you can eat it with a spoon. I have no idea how it manages this with a relatively short cooking time, but it does, thank goodness. Of course now that I promised you that, yours will turn out like shoe leather and you'll think I'm a fraud (as you gnaw your way through dinner). If you're working with a previously-frozen roast, please make sure it's fully defrosted before you put it in the oven. The easiest way to defrost frozen meat of any kind is to place it in a big bowl of tap water in the fridge (in a ziplock bag, if it came from the butcher's in paper). I never use countertop-defrosting for meat (the cats would eat it, anyway) for food safety reasons. Once the meat is defrosted, mix the salt, pepper and garlic powder in a little bowl, and pat the roast on all sides with the mixture. Place in the fridge on a plate (covered tightly in saran wrap to prevent drying out) and let the meat season for a few hours, or overnight if possible. If you're in a rush, just season the roast, then set aside while you chop the veggies. Wash and chop carrots, celery, onions, and mushrooms, and place them together in a medium-sized bowl. If you have it a bottle of red wine open, splash a little wine into the pot, to deglaze the seared meat bits from the bottom (if not, this gives you a good excuse to open a bottle of red wine). Turn up the heat a bit, add 2 more Tbsp. butter, and sauté carrots, celery, onions, garlic, and mushrooms until they've started to turn a deeper color and smell savory and aromatic, about 10 minutes. (In my book, sauté means "To cook over medium heat while stirring occasionally, but never making the grave error of walking away and coming back 10 minutes later to scorched vegetables." You will know you are sautéing correctly when, about 4 minutes in, your spouse/children wander into the kitchen and begin to sniff the air hungrily, asking what's for dinner.) Turn down heat to medium-low, then add tomato paste, and stir into the vegetables; spread them into an even layer. Turn off the heat and carefully place the roast on top of the vegetables, arranging the herbs around it evenly. Pour the beef broth over everything, adding filtered water (as needed) to cover the vegetables and fill the Dutch oven about 3/4 of the way full (you do not, however, need to completely submerge the meat). Cover the pot with its lid and, using oven mitts, place in the hot oven (depending on the pot you're using, you may have to lower your oven rack to accommodate the pot's lid). Really watch your forearms when taking the Dutch oven in and out of your oven...I've burned myself a couple times on the upper element, oven mitts and all. Cook for 1 1/2 hours (90 minutes), then turn the roast over. 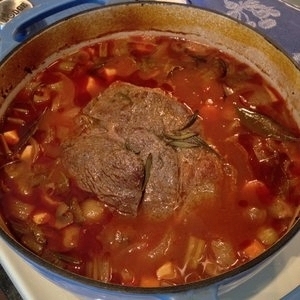 Add more water as needed to keep the vegetables from drying out, but not so much so that the pot roast becomes a soup. Cover, return to oven, and cook for an additional 1 hour (plus 30 minutes more or so, if your roast is on the 4-pound side) until the roast is nice and tender. When you're ready to serve the pot roast, you can carefully lift it out of the pot and slice before serving if you wish, or just break it into tender chunks with a fork right in the pot. Serve the pot roast and broth in bowls over hot rice. 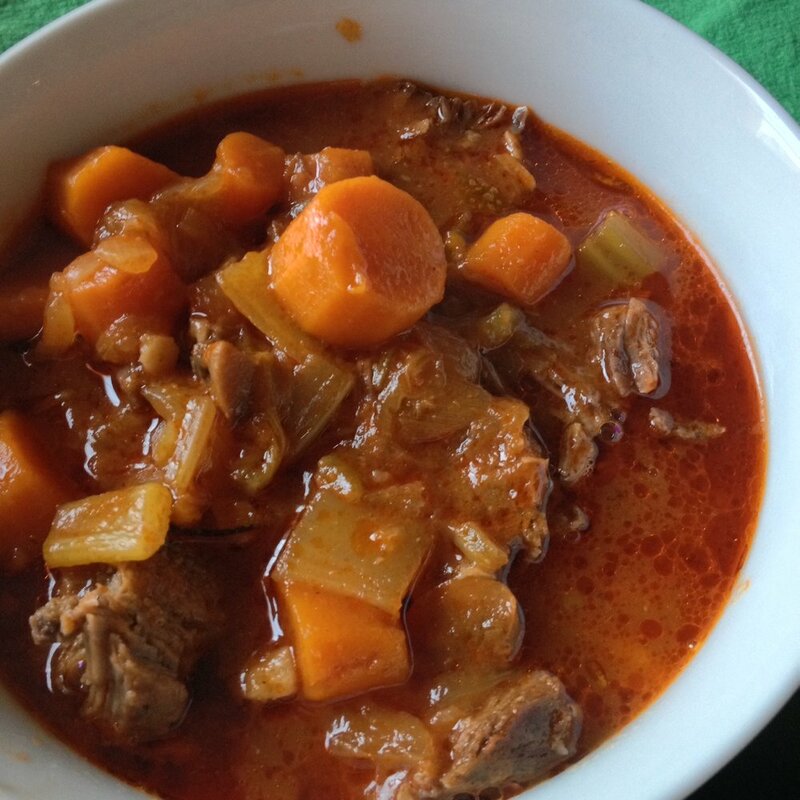 This is also really good if you slice up the pot roast (remove it from the Dutch oven and slice on a cutting board), and thicken up about 2 cups of the pot roast cooking liquid in a separate small pot. You can do this by mixing 2 Tbsp. cornstarch and 1/4 cup water in a little bowl until smooth, and then stirring the mixture into the pot roast sauce, so it makes a gravy. Leftover gravy thickens up even better: once it's been refrigerated overnight, it's much denser naturally, and you can use less cornstarch to do the job. * Good to know: this meal will make an absolute mess of the white interior of your pretty enameled Dutch oven (this will not hurt it, though, since nothing touches Lodge pots...the picture of grit and resilience. If I was a pot, I'd want to be a Lodge). Liberal quantities of baking soda + a little water + elbow grease will do the trick: if you do that first, and then wash with dish soap, you'll get the pot as clean as it is ever gonna get. I dry my Lodge pots and skillets by placing the washed/wet pots in the oven at 350° F for 8-10 minutes, and then I turn off the oven and let them sit in there overnight. This will help prevent serious rusting, even in very humid climates like the South.